Grapefruit is a popular and wholesome breakfast food. According to the U.S. Department of Agriculture, grapefruit is the second leading citrus fruit consumed per capita in the United States. Grapefruits are rich in vitamin A, ascorbic acid, folic acid, potassium, fiber and flavonoids. However, grapefruit interferes with the metabolism or absorption of several prescription drugs. In some cases, this leads to dangerously elevated blood levels of these medications. In others cases, blood levels may be decreased. Your intestine is a site of extensive metabolism for medications and other substances that could potentially prove toxic to your body. The cells lining your digestive tract possess enzymes called cytochromes, which break down many foreign compounds before they are allowed to enter your bloodstream. A specific enzyme called CYP 3A4 -- one of the primary cytochromes involved in this "first pass" metabolism of drugs -- is inhibited by grapefruit and grapefruit juice. This allows higher doses of certain medications to enter your bloodstream. According to The People's Pharmacy, this trait is responsible for more than 30 drug-grapefruit interactions. Grapefruit has been shown to decrease the blood levels of some medications, such as antihistamines, thyroid medications and beta-blockers used for treating blood pressure. Grapefruit appears to inhibit specific intestinal receptors that are responsible for facilitating the absorption of these medications. Since absorption is impaired, less of a given medication is absorbed from your intestine, and your blood levels of the medication drop. A study published in the September 2005 issue of "British Journal of Clinical Pharmacology" discussed the case of a young hypothyroid woman whose blood thyroxine levels fell following heavy consumption of grapefruit juice. In this case, the patient's use of grapefruit was sufficient to cause a significant decrease in her thyroxine levels, despite an increase in her medication dosage. The ensuing study, using 200 mL of grapefruit juice three times daily for only two days, showed a 10 percent decline in the absorption of levothyroxine due to grapefruit consumption. Grapefruit and grapefruit juice interact with a variety of medications through at least two distinct mechanisms. By inhibiting cytochrome enzymes, grapefruit allows higher-than-normal levels of some medications to enter your bloodstream. Through interference with intestinal absorption, grapefruit lowers the blood levels of other drugs, including thyroid medications. 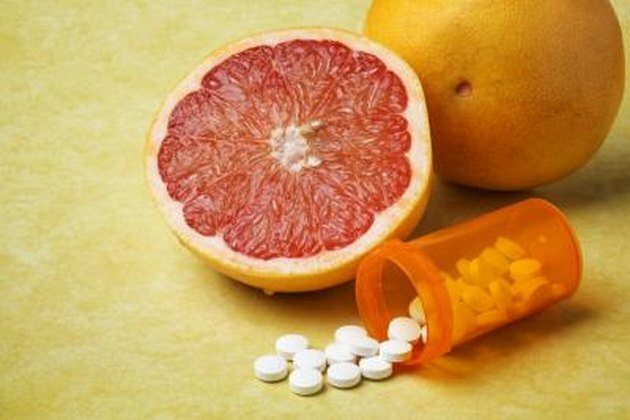 Although drug dosages can be adjusted to compensate for the routine consumption of grapefruit, a day or two of abstinence or surplus consumption can alter your drug levels. If you are taking a prescription medication, ask your physician or pharmacist if you should avoid consuming grapefruit.